CAIRNS Saints product Caleb Graham has credited his family’s support on the Gold Coast throughout a difficult 2018 to push him towards this week’s AFL draft. The key position prospect is all but certain to find an AFL home today or tomorrow, likely to be on the Gold Coast, but if he was draft eligible 12 months ago, Graham would have been snapped up much earlier, such was the interest around the Far North teenager. The 18-year-old was once touted as a top 25 selection in the 2018 draft but after a tumultuous season, Graham is likely to slide to late in tomorrow’s draft and become a Sun. 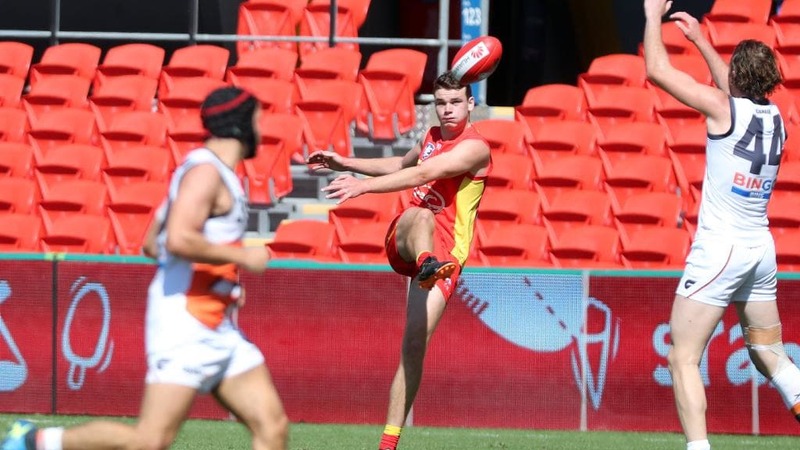 With the Suns NEAFL squad lacking key position talent, the AFL Cairns junior was thrown around the ground, playing forward, back and as an undersized ruckman, instead of where he feels most comfortable, as a rebounding defender. While circumstances were not always going Graham’s way on the field, he always had his parents and siblings to come home to on the Glitter Strip, instead of looking for advice and guidance over the phone. “This year it was so draft, draft, draft — it was obviously such a focus,” Graham said. “It was awesome to have the family with me, and Jacob Heron, who moved down with us originally, it was so helpful. “The family move was because of my footy but they were also interested in a lifestyle change after living in Cairns for much of their life, so it made sense. “I am forever grateful for what they have done, it has helped me so much the last few years. The Griffith University student said the nerves started to kick in earlier this week ahead of the life-changing draft but he was also filled with excitement about what is next in his career. Suns academy coach Andrew Raines believes Graham is set for a long career as a key defender. “This year was really tough for him, he played all over the place, and it was tough for him to balance it between forward, back and ruck,” Raines said. “I see him as a key defender, and I think we all do at the Suns. “Sometimes to take a few steps forward in your career you need to take a few steps back. Former Saints teammate Jack Philp was hopeful Graham would push on after a positive start at Griffiths Park. “He is pretty tall, athletic and agile,” Philp said. “He is the type of player that looks out of the contest then gets a quick fist in.